I just want to say that Jacky of Enogear/Fireflies did just reply to my email and sent me my replacement Enogear AA stainless steel and sent me a free stainless steel 14500 usb rechargeable light. Therefore I will definitely buy more of the ROT66 soon. Can I send my DOA XP-L back? I’m surprised your MF01 look that much brighter than the ROT66 and even more surprised that it is so much more on the rosy side of the BBL than even the Cree 3A. I have two MF01, one stock and one with Lexel’s buck driver. The 219C tint on both is on the greenish side of the BBL. One is significantly greener than the other. The MF01 renders colors the best in your comparison. I think you won the tint lottery with the 219C. The MF01 219C v1 (6 wires) is more one the rosy side than the MF01 219C v2 (2 wires) that is more on the yellow/green side. If I remember well, charles lin’s MF01 is a v1, both of yours are probably v2. If the aux led board was offered with more emitter color choices, it would be a certain hit. Many people didn’t like that Emisar only offered the cyan ones. This would have been a opportunity to set your stuff apart. Yes please, amber secondary would be much more useful than blue. Fireflies, can you post some photos of the board itself and installation procedure? Does the firmware of older lights support it properly? I’m ocd and it kinda bugs me that the emitters on the side switch aren’t the same color of blue as the gitd strip. Aux LEDs could alleviate that I guess but I like the subtle glow and color of the gitd strip. 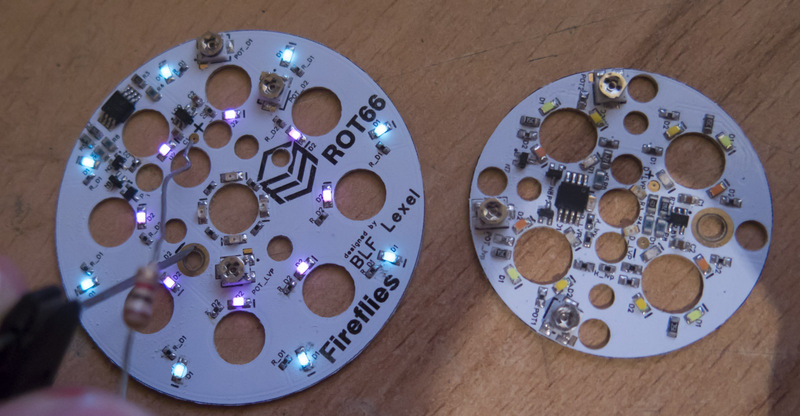 Talking about tiny amber smd leds, has anyone found a version yet that is a phosfor-converted amber? (so more efficient than direct amber leds) I have several PC-amber leds in powerled version but have not seen them in tiny format. Does the firmware of older lights support it properly? Good question. If not though, I should have Anduril working on the ROT66 soon, and it can run aux LEDs in four different modes if compiled with that option. +1. I want amber and pink/purple aux lights to match the 219B 9080. Would be good if Fireflies can include Anduril in the next batch. Lexel doesn’t support Anduril so it’s not likely to happen. I should have Anduril working on the ROT66 soon, and it can run aux LEDs in four different modes if compiled with that option. I think there’s a good chance of Anduril or something Anduril-like on a Fireflies light, since they’re looking for something like NarsilM but simpler. I’ve got it running on a ROT66, as of about an hour ago, but I’m not done calibrating things yet. Gotta get the ramp shape fixed and the voltage calibrated, etc. However, with a 3-channel driver and a switch LED, Anduril compiles just a few bytes too big to fit when I have all the options enabled. So for now I turned off the option for a blinking switch LED. It’s a little awkward anyway, with the arrangement of two always-on LEDs and two which can turn off. Long-term though, I hope I can reduce the base code size a little bit so it’ll fit. Has anyone received an XP-L version that was intact and working as advertised? I have one en-route and am a bit fidgety about accepting the delivery. Yeah, they would need your help to do it because I don’t think Lexel wants to mess with a new UI. I’m guessing all Firelies needs is a good working version of Anduril from you and they can send it to their people flashing the drivers. On a side note, does the aux board wire into the same spot as the MCU controlled switch lights? So you set both sets of lights off, low or high? I’m guessing yes? The pin layout is pretty full. There is nowhere to attach it except pin 7, which is already driving the switch LEDs. I got ya. The D4S does not have switch lights so you ran it’s aux board to the “switch light” output. Then, the fact it’s 2 channel (instead of 3 channel on the ROT66) means you have one leftover pin free. I’ve been away for some time so missed this, which is really interesting. 1: How do I buy one ? and from where ? preferably at a BLF price. 3: Clearly the BLF gurus have been involved in the development and are continuing work. Any background info would be welcome (PM if necessary). Fireflies is a new company but with some (they mentioned to me) experienced guys who worked for other flashlight companies before (they will not:say which). Before releasing their first flashlight they contacted several people on BLF for advice (they asked me about leds), which is a clever move, but they also have a good nose themselves for what are wanted features and are especially keen on high CRI. That is about what I know. Their first runs of their first flashlight, ROT66, show some teething problems but is seems sofar that they are very willing to solve that for the customers. Finally got my Nichia version from the group buy. First I thought they forgot the switch but then I noticed it was only the underdesigned lanyard mount . But there was something black visible on the center LED, after removing the bezel it turned out as a solder clump. Removed it and light is ok now. Glad I checked before running the LED on full for a while which might have have burned the LEDs dome. End control could be better though. Bezel was very tight btw. and made a terrible squeaking noise when turning. I added some grease to the threads since I have to open the bezel again in future for a planned mod. Did a rough lumen measurement with my Nicha version and got about 4800 to 5000 lumens at start, checked my last unmodified Q8 against and they showed almost the same values (within one or two percent), both with 30Q. Very nice tint, Q8 is green in direct comparison. But it gets hot very fast – much, much faster than the Q8. Temperature sensor doesn’t seem to be adjusted yet, after a couple of seconds the light is too hot to touch. Anyway, I’m pretty impressed with this light! I have to say, for a first run “showing some teething problems”, I absolutely love my nichia version of this light. No problems what so ever. it gets hot very fast – much, much faster than the Q8. Temperature sensor doesn’t seem to be adjusted yet, after a couple of seconds the light is too hot to touch. Anyway, I’m pretty impressed with this light! It doesn’t get so hot like that, but it might potentially err in the other direction. As soon as it thinks it’s going to overheat, it glides down to about 2000 lm. The sensor can be calibrated though, and the temperature limit set to whatever you like.